Humphrey Duke of Gloucester – History… the interesting bits! Jacqueline of Hainault, also known as Jacoba of Bavaria, is one of those Medieval ladies who seems to have slipped under the radar of history. Until last week I knew very little about her; and yet her life is one of the most colourful I have ever come across. Born on the 25th July 1401 at Le Quesnoy, Flanders, Jacqueline was the daughter of William VI, Count of Holland, and Marguerite of Burgundy; her grandfather was Philippe the Bold, Duke of Burgundy. Although she had at least 9 illegitimate siblings, Jacqueline was her father’s sole heir. And in order to strengthen her position, William arranged a marriage for Jacqueline while she was still an infant. In 1406 she was betrothed to John of Valois, Duke of Touraine, the fourth son of King Charles VI of France, and only 3 years older than Jacqueline. 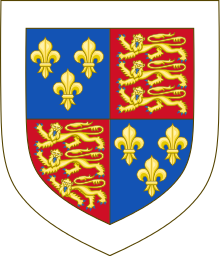 With little chance of inheriting the French throne, and with a view to him eventually ruling Hainault, the responsibility for John’s education was handed over to Count William; he would be raised alongside his future wife. The young couple married in 1415 at The Hague. Only 4 months after the wedding John’s older brother Louis, Dauphin of France, died and John became Dauphin and heir to the French throne. Within 2 years John himself was dead, on 4th April 1417, with rumours circulating that he was poisoned, although this is far from certain. His younger brother, Charles, became Dauphin and Jacqueline was a widow at only 16. In the meantime, although Holland was not subject to Salic Law (where a woman could not inherit), Jacqueline’s father had been having a hard time getting his people and Sigismund, the Holy Roman Emperor, to accept Jacqueline as his heir. They finally refused outright in 1416. When Count William died only 2 months after her husband, on 31st May 1417, Jacqueline was accepted as Countess of Hainault; however Holland and Zeeland recognised her uncle John of Bavaria, backed by Sigismund, as their count. At this point Jacqueline’s mother and uncle stepped in. Margaret of Burgundy and her brother, John the Fearless, Duke of Burgundy, started looking around for a suitable husband for Jacqueline. Unfortunately they decided on her cousin John IV, Duke of Brabant. 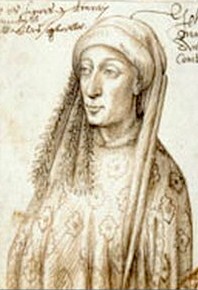 The Duke of Burgundy saw the marriage as an opportunity to expand his influence over Jacqueline’s lands, and applied for a Papal Dispensation. The Dispensation was given, but withdrawn just over 2 weeks later, following pressure from Sigismund. The couple married anyway, in March 1418. The marriage was a disaster, politically and personally. John managed to antagonise both his wife and her subjects. Initially Jacqueline’s husband helped in the fight against her avaricious uncle, John of Bavaria and in 1419 John the Fearless settled the dispute in his niece’s favour; only for John of Brabant to then mortgage Holland and Zeeland to John of Bavaria for a period of 12 years. Jacqueline ran away; first to her mother in Hainault and then on to England, where she was welcomed by Henry V. The king granted her a pension, and made her godmother to his only son, the future Henry VI. In 1421 Jacqueline repudiated her marriage to John of Brabant, with the support of Antipope Benedict XIII in Avignon. And in 1422, with a view to strengthening England’s position against France, she married the king’s younger brother Humphrey, Duke of Gloucester. The public were behind the marriage and even supported Humphrey’s attempts to recover Jacqueline’s lands. As Duchess of Gloucester, Jacqueline was made a Lady of the Garter in 1423, and, at some point, accepted Eleanor Cobham into her household as a lady-in-waiting; Eleanor would later go on to become Humphrey’s 2nd wife. In 1424 Jacqueline gave birth to her only recorded child, who was stillborn. In 1424 Humphrey and Jacqueline led an army to the Low Countries, to recover Jacqueline;s inheritance. Though Humphrey managed to recover much of Hainault, he came up against opposition from the new Duke of Burgundy, Philip III The Good, destroying the Anglo-Burgundian alliance. 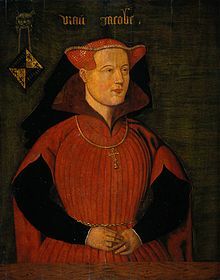 Many of Jacqueline’s subjects, however, considered Humphrey an invader and, refusing to recognising him as count, gave their support to Burgundy. So, in 1425, Humphrey returned to England; Jacqueline’s mother had objected to her returning with him, so she moved on to Mons. The officials of Mons had promised to protect Jacqueline, but once Gloucester was gone, she was handed over to the Duke of Burgundy and imprisoned in Ghent. In the same year her uncle, John of Bavaria, died and her lands were handed over to Burgundy, as regent, by John of Brabant. 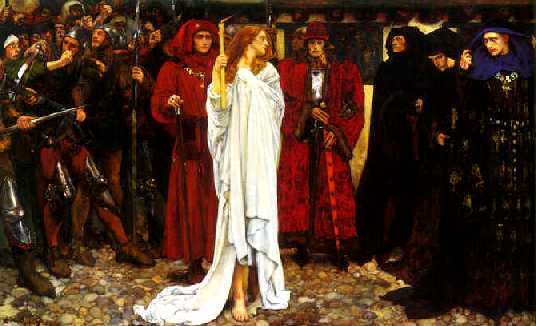 Jacqueline escaped her imprisonment, dressed as a man, and escaped escorted by 2 knights, to Gouda. From Gouda, she led the Dutch resistance to the Burgundian takeover. However, when Burgundy besieged Gouda, she was forced to surrender. In the meantime, Pope Martin V had authorised an investigation into the state of Jacqueline’s marriages. In 1428 he declared her marriage to Humphrey of Gloucester null and void, as her marriage to John of Brabant was legally valid. 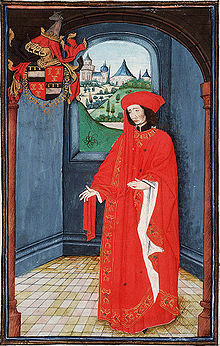 John of Brabant had died in 1426, so a remarriage between Humphrey and Jacqueline would have been acceptable – had Humphrey’s attentions not already turned to Eleanor Cobham. Jacqueline still had sympathisers in England, however and the ladies of London petitioned Humphrey, according to the chronicler Stow their letters “containing matter of rebuke and sharpe reprehension of the Duke of Gloucester, because he would not deliver his wife Jacqueline out of her grievous imprisonment, being then held prisoner by the Duke of Burgundy, suffering her to remaine so unkindly, contrary to the law of God and the honourable estate of matrimony”. Humphrey had managed to get a 9,000 marks grant from the king’s council, in 1427, to help Jacqueline recover her lands; however John, Duke of Bedford, put a stop to the expedition by opening up negotiations with the Duke of Burgundy. So, in 1428, Jacqueline of Hainault is a prisoner of the Duke of Burgundy, with no prospect of help from England. With few options left to her, she came to an agreement with Philip the Good. In the Treaty of Delft, of 3rd July 1428, Jacqueline retained her title of countess, but administration for her 3 counties passed to Philip. Philip the Good was confirmed as her heir, should she die childless; and she was not to marry without the consent of Philip, her mother and the 3 counties. Philip, however, broke the treaty by mortgaging the revenues of Holland and Zeeland to members of the Borselen family from Zeeland. 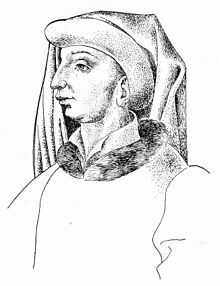 In 1432 Jacqueline secretly married one of the Borselen family, Francis, Lord of Zuilen and St Maartensdijk. Whether or not this was a plot to overthrow Burgundian rule in Holland, Philip the good certainly saw it that way. 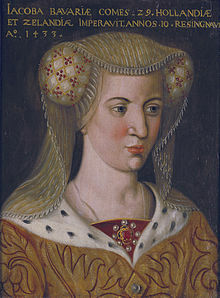 Francis was imprisoned in October 1432 and Jacqueline was forced to abdicate as countess in 1433, relinquishing her titles in return for an income from several estates. After years of civil war, Jacqueline’s financial position prior to the settlement had been desperate. Jacqueline and Francis’ relationship appears to have been a love match and, in July 1434 they had a 2nd, public, marriage ceremony at Maartensdijk Castle. After such an adventurous life, and having fought so hard for her inheritance, Jacqueline settled down to married life. Her happiness was short-lived, however, as Jacqueline died at Teilingen on 8th October 1436, probably of tuberculosis. She was buried at the Hague. Sources: Brewer’s British Royalty by David Williamson; History Today Companion to British History Edited by Juliet Gardiner and Neil Wenborn; Britain’s Royal Families, the Complete Genealogy by Alison Weir; medievalists.net; r3.org; susanhigginbotham.com; britannica.com; historyofroyalwomen.com.